recently for P.O.S.) 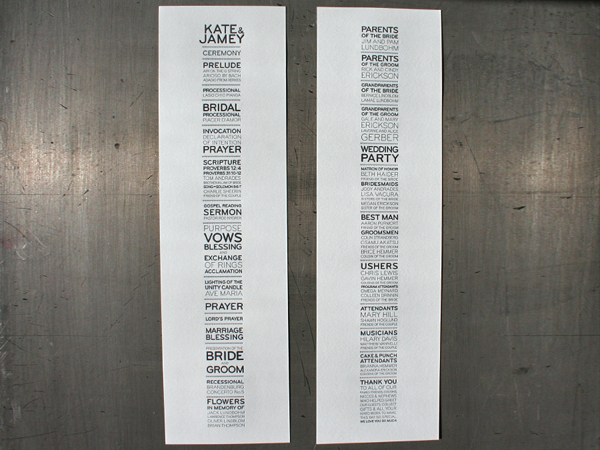 The column layout using justified type accents information and creates heirarchy in a way unique to wedding invitations. The invite set was letterpress printed in our studio with black and silver ink on a single press sheet to keep costs reasonable. (just the little dotted lines of hearts are in silver) The whole invitation set uses Crane Lettra 110lb Pearl White cotton paper stock with matching envelopes. The program card was printed separately closer to the wedding date. It is a very long and narrow card format with printing on each side to handle all the program information. All in all, simple type, done up proper.